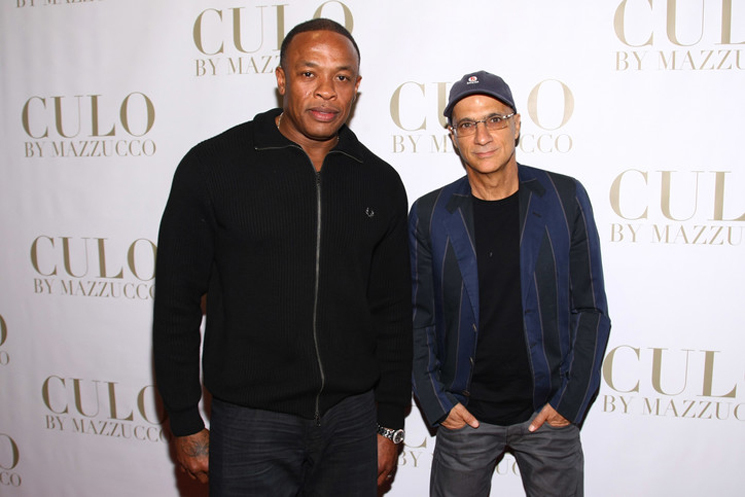 Music industry giants Dr. Dre and Jimmy Iovine have forged an unlikely yet longstanding partnership through their many years in the business. Next year, HBO will take a closer look at their working relationship in a four-part documentary series. Titled The Defiant Ones, the Allen Hughes-directed project is described by HBO as "an unquestionably bold film about the unlikely but ultimately unbreakable bond of trust and friendship between two street-smart men from different worlds who have shaped many of the most exciting and extreme moments in recent pop culture." Deadline reports that the series was filmed over a three-year period and will feature interviews with Bono, David Geffen, Eminem, Nas, Ice Cube, Gwen Stefani, Jon Landau, Tom Petty, Trent Reznor, Snoop Dogg, Bruce Springsteen and will.i.am. The Defiant Ones is also said to include previously unseen footage from studio sessions with the likes of Eazy-E, JJ Fad, Stevie Nicks, N.W.A., Tom Petty, Bruce Springsteen, U2 and more. Hughes will also serve as executive producer alongside Doug Pray, Andrew Kosove, Broderick Johnson, Laura Lancaster, Jerry Longarzo, Michael Lombardo and Gene Kirkwood. Music for the series will come from Atticus Ross, Leopold Ross and Claudia Sarne. As of press time, there is no set release date for the series.